Capoeira: Martial Art or Dance? A spectacle implies an impressive, attention-demanding act. Capoeira is a spectacle to behold. This art form has been generically referred to as a martial art or a dance. It is solely neither, nor is it a combination of the two. A ritual born in 16th century Brazil by African slaves mixes elements of dance, martial arts and games that culminate in a fierce combat. Though the actual history of Capoeira is debated, it surely won’t be history anytime soon. Capoeira is a philosophy that has survived years and miles to find a home here in the United States. 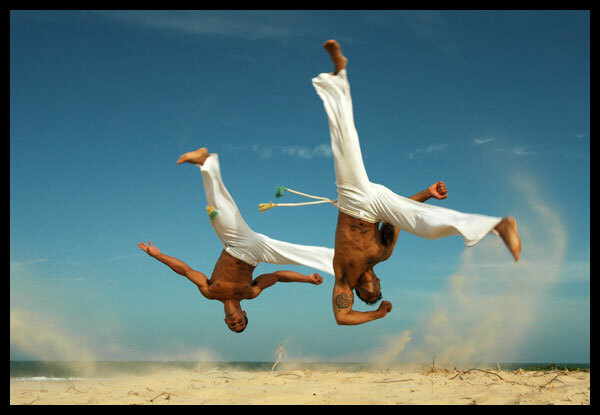 Americans are finding truth and principles in the grace and acrobatics of Capoeira. With none of the rigidity of the martial arts, all of the grace of dance and freedom of play, this art form teaches its participants to be aware of and resist oppression. One of the stories behind the dance’s creation was that slave would hide their combat practice behind music and what appeared to be dancing. In this way, Capoeira teaches that a participant must be strong and honest to embrace the beauty and freedom of expression offered in the battle. Current students of Capoeira seek to free themselves of worry and stress while building strong minds and bodies. When the dance first traveled to the states it was considered a practice of the poor, but has now expanded to people from all walks of life. Competitors at every level must be baptized into Capoeira and graduate, as with other martial arts, with the ultimate goal of becoming a Mestre– or Master– of the field. Clearly this tradition offers us something we were missing, something we could engage in that allows us to be. A Capoeira showing is referred to as a performance. Though it retains its roots in battle and can be dangerous, it carries with it the same refinement of dance, led by music. Capoeiristas battle each other one on one with adroit movements– kicks, sweeps, head butts and acrobatics– that must be precise so as to maintain integrity. The participants are as strong and adept as any martial artist or break dancer. These performers for the most part will not make contact but there are groups of Capoeiristas who do engage in actual combat. The drumbeat and rise and fall of voices instruct the players on speed and rhythm of their movements. Weakness or second guessing oneself could lead to injury in this sport; and like the Oleander, beautiful and ever so dangerous. One particular institute in Chicago is Gingarte Capoeira– directed by Contra Mestre Marisa Cordeiro, the academy has been open since 1991. Mestre Marisa is one of the highest ranking Capoeiristas in the world and was trained in Brazil by some of the top instructors of the sport. The school is a non-profit organization whose goal is to preserve the culture and tradition of Capoeira and to educate communities by making the art form accessible. They are now over 100 strong and growing. The largest Capoeira Organization in the Midwest also offer s instruction in other arts and has two locations. The fact that the Gingarte Capoeira, under Marisa’s leadership, has grown so successfully indicates that people are thirsty for a form of expression that embraces culture and tradtion while promoting strong minds, bodies and principals. However, when no one was watching, the dance became a graceful battle and the slaves transformed into formidable warriors. Capoeira is a tale of a culture and tradition that will resist oppression honestly, respectfully and with rhythm. Posted on June 13, 2016 Categories AfricanTags african dance, brazil, capoeiraLeave a comment on Capoeira: Martial Art or Dance?